"To control the evolution of humans. To create a more perfect human being." Sarah is freaking out about the tech in her mouth which will henceforth be called the mouth maggot. She is desperate to know more and unfortunately, Cosima doesn't know much at this point. Cosima cannot even say what the mouth maggot's purpose is or how it works. Determined to find out about the mouth maggot, Sarah decides to grab Felix and go and see Dizzy. Sarah's first stop is to visit Felix, who isn't home when she arrives. Sarah's meets Adele, Felix's half sister, who seems to love drugs and booze just like Felix. When Felix does arrive, he does the introductions and an impatient Sarah asks to speak to him alone. Sarah expects Felix to just kick his sister out and go with her but Felix refuses to do that saying he is tired of dropping everything on command. I gotta say, I like this new Felix. Felix explains that spending time with Adele is important to him. My only worry is now that Felix demanding that Sarah at least have the courtesy that has a life of his own and is no her slave to be ordered about that we will see less of his character. Dizzy isn't pleased to see Sarah and she explains that she's M.K. 's sister and needs help finding her. Unfortunately for Sarah, Dizzy has no idea how to contact M.K. because M.K. is the one who does the reaching out. It's only when Sarah shows Dizzy the mouth maggot that he decides to talk to her. It seems that Dizzy has been hearing about the mouth maggots for awhile and some people think that it's a monitor which delivers diabetes meds or even narcotics but Dizzy believes that because of the proximity of the brain, the mouth maggot must have a nefarious purpose. Dizzy does have more than scary ideas for Sarah, he has a name - Alonzo Martinez. Sarah then heads to see Art, who informs her that someone by the name of Alonzo Martinez, has recently removed back to Colombia but they did return for a one day to visit a dental clinic which specializes in dental implants. Sarah heads to the clinic and is recognized as Beth by the hygienist. The woman is resistant to helping until Sarah/Beth reveals that she has a mouth maggot. Once the hygienist closes down the clinic, she sits Sarah/Beth in a chair and pokes her cheek with an instrument explaining that if she moves, she could die. It seems that the hygienist feels that Sarah/Beth is lucky to have been chosen for the mouth maggot and has therefore called her superiors. For her trouble, the hygienist has her throat slit but none other than Ferdinand (yep, he's alive). Ferdinand pulls the instrument out of Sarah's mouth explaining that if the hygienist had punctured the mouth maggot, she'd already be dead. Ferdinand reveals that he got a message from Rachel Duncan, my least favourite clone. In this Rachel update (did anyone really care what happened to her?) she's in captivity with Charlotte and Ira and is being held by none other than Mommy Dearest, or should I say Susan Duncan. We watch as Ira (a castor clone not raised with his brothers) gives Rachel a treatment to try and make her high tech new eye look more normal. Rachel is physically slowly getting better and her mind is sharp as ever. Rachel is quick to deduce that Susan has been outsmarted by Sarah and did not find the Original. We also learn that Charlotte is a direct clone of Rachel. Clearly, the reunion between Rachel and Susan isn't warm and is more like a horrible family gathering that you have to get drunk to survive. Rachel gets hers though. We see her sit down to paint with Charlotte and because of the size of the easel, they are able to hide what they are doing from the eye in the sky. Rachel uses this opportunity to check and see if Charlotte delivered her message. Helena is living with Hendrixs. After learning that Sarah has a mouth maggot and that Cosima cannot do anything until she has a sample to work on, Allison decides that they need to dig up Leekie. Donny is not down with this plan but Allison is determined to help Sarah. Helena is not at all pleased that she has been left completely out of the loop, saying that Sarah won't even return her calls. Allison tells Helena that they don't need her kind of help and Donny encourages her to focus on gestating. I'm so not cool with Helena being shoved to the sidelines. Helena is left to watch the kids while Donny and Allison get to work in the garage. When the doorbell rings, Helena answers only to discover that the cops want to talk to Allison. Believing Helena to be Allison, they start to question why her election signs were found at Pouchy's crime scene. Helena plays hostess and says that she doesn't know. When Donny walks in, Helena explains what the cops are doing there. When the cops start questioning Helena about Allison's campaign, a very nervous Donny answers the questions. The cops make it clear that Helena/Allison must answer for herself. Helena doesn't miss a beat and lists off the people Allison worked with, greatly surprising both Allison and Donny. Yes, Helena has a brain in her head and is not just the heavy in the room. The cops leave but they are clearly still very suspicious. Finally Cosima, who has been left in charge of while Sarah investigates the mouth maggot and Siobhan goes to look for someone to remove it. Kira is not in a good mood because she is very aware that something bad is going on and is pissed off that none of the adults will tell her anything. Kira spaces out and when Cosima finally get her attention, Kira explains that she was dreaming. It seems that Cosima saw her mother with all of her aunties and Sarah had been set on fire by Cosima. 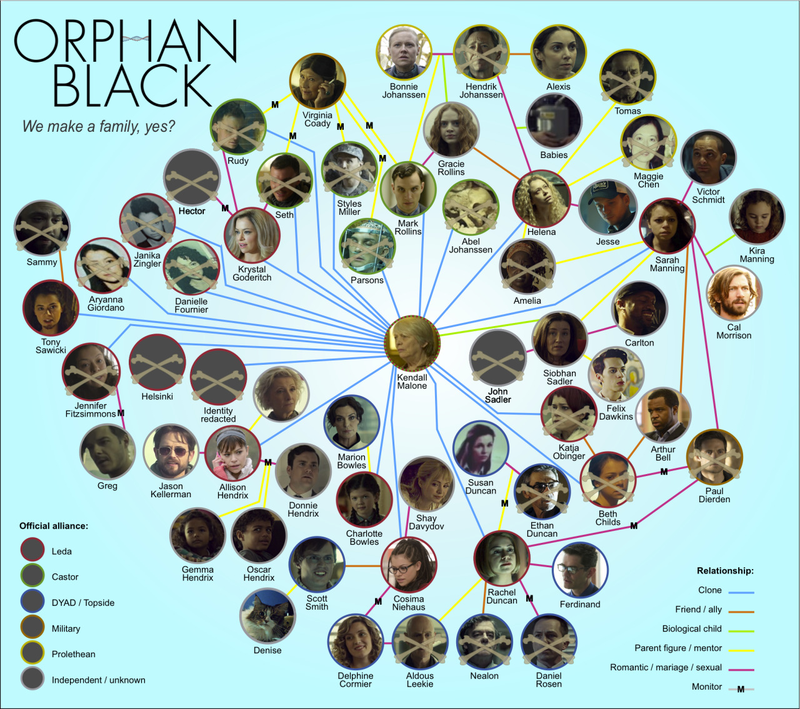 When is Orphan Black going to get around to explaining Kira's special abilities? Did I miss something somehow? Cosima is clearly creeped out by the whole thing and tries to assure Kira that she would never do that. Kira responds that Cosima had no choice. This week we were reminded that there are several moving parts to Orphan Black. I have to admit that sometimes, there was just so much going on that I had to stop and try to figure things it. It took me awhile to remember who Pouchy was and his relationship to the Hendrixs. The writers really require to viewer to pay attention because they have a habit of just bringing things up out of the blue. You never quite know when something will suddenly become relevant. I continue to be pleased the Felix is at last asserting that he is not Sarah's slave but I am however worried that this means his character will be shunted to the sidelines. If that happens Cosima will be the only LGBT character. Felix has always deserved to be treated better and it's nice to see him go after what he wants. My only worry is that Adele isn't really Felix's sister and is somehow involved in clone business. Felix deserves his only separate story line and not be driven right into Sarah's bossy arms. Donny and Allison's antics continue to crack me up but I dislike the way that they are so judgmental of Helena and shift her to the sidelines as though she is some burden that they have to carry. They just love it up there on their high horse, they forget that they are also murderers and can hardly be called paragons of morality. I love the way she proved to them how smart she is. If anything, it was Donny's antics that made the cops suspicious and not anything Helena did.